I mean that title in a good way. I was impressed with this show for many reasons, but the foremost was the interesting, thoughtful story that they told extremely well. The second is that it spoke authentically to the nerd fringe community. I know, ‘nerd culture’ is the hip thing right now with comic book movies dominating the box office, but I agree with the sentiment that this newfound cash cow does not represent the community in a real way. Though it does help to normalize some nerd culture. 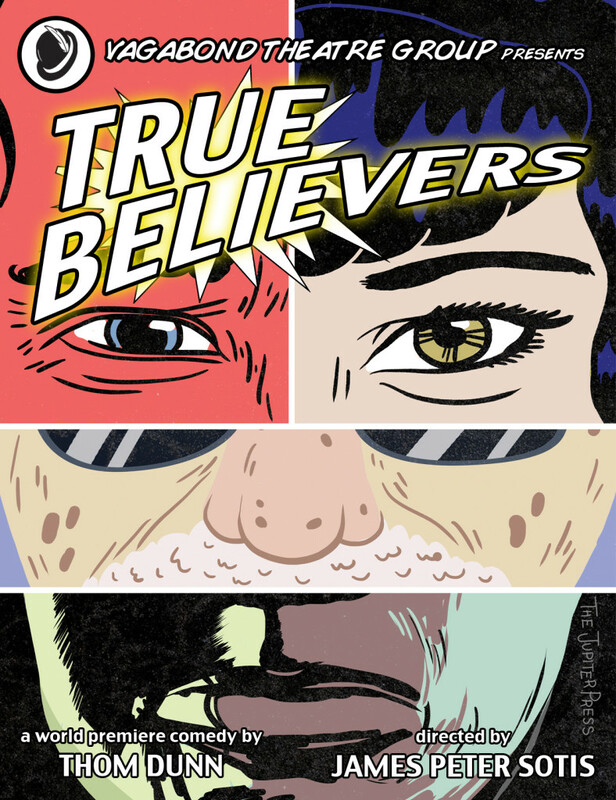 True Believers by Thom Dunn feels like a play that intimately knows what conventions are like. As a frequenter of conventions myself, I appreciate it endlessly; Director James Peter Sotis slipped in so many shout-outs and subtle references that I caught (and plenty I’m sure I missed) that it seems clear the folks at Vagabond also know a thing or two about cons. But fear not, you need absolutely no experience with comic book conventions, or any other part of geekdom to understand the heart of this play. This is a character piece, as the actual plot takes a while to form– Chad Mailer, a has-been comic writer attends a comic-con; stuff happens. However, the characters are so vivid and fascinating that I barely noticed that not much had actually “happened.” Also aiding in my wonderment: this is the best teched show I’ve ever seen at The Factory Theater. Hands down. And they use it to tell the story, not to hide flaws or add useless flash. From the nine people listed on the Animation Team and my inability to recognize what game was being played – I have a sneaking suspicion that they went the extra mile and animated their own scenes of an MMORPG (massively multi-player online role playing game) for two characters to interact. Wow am I impressed. It looks great and is integrated perfectly into the flow, as well as the vblog scenes that flow seamlessly from projected image to live scene. (Not to mention the conspicuous descending urinal for the hilarious bathroom scenes). More importantly, genuinely great acting supports both the smart script and tech. Everyone has comic timing, including ensemble members Anne Colpitts and Steve Marois. Colpitts and Marois add to the comedy and never detract from the drama, a hard line to walk in a show where funny and serious turn on a dime. I thoroughly enjoyed Jim Remmes as Box and Zach Winston as Billy Horowitz as parodies of the absurd people found in any industry, and any fandom. Although both have a tendency to be a little too much for my taste, and the head of Stan Lee joke certainly got stale before they let it die – though their energy and commitment continued to make me laugh throughout the show. Jim Remmes’ Box also has the most moving moment in the show, which I will come back to in the least spoilery way possible. Ted Thompson, played by Michael Avellar, poses a bit of a problem. The script makes a running joke of his anger issues, but keeps giving him legitimate reasons to be angry – this leaves the character feeling sort of hollow. I’m almost certain this is an artifact of the script rather than Avellar’s performance since he appeared to be working hard to bring depth to a one dimensional character. Even the end of the play only addresses Ted’s effect on Chloe (played beautifully by Rachel Katherine Alexander) instead of looking at Ted himself. This shortcoming is especially noticeable in the cast of well-constructed characters, like Chloe and Calvin. Chloe was one of my favorites. Her character represents the exact kind of person you meet at every con and immediately make your friend. Alexander was sweet, endearing, and, as she protests, young but not weak. Much the same is true for Calvin Elder/Avenger played by Jeff Marcus. The script incorporates elements of comic book stories – dark pasts, rural beginnings, malicious cyborgs – and Calvin’s is the superhero origin story. Although his coming out statement to Chad Mailer as the ending note of the play seems unnecessary since his persuasion is apparent early on, it fits well into a play deeply aware of the current issues in the comic book community. No character was more aware than Kt Watts. I can’t believe I made it this far into this review without mentioning Caitlyn Conley. She is, without contest, the brightest star on stage. I had the pleasure of seeing her in Wandaleria earlier this year and could not have been happier to see her here. Kt Watts is the most interesting character to me because of the brilliant writing and Conley’s inspired acting. Conley is so captivating; I will make an effort to see any show she’s in from now on. Her first appearance, wearing a refrigerator box in reference to Women in Refrigerators (an online list of female comic book characters, specifically female superheroes who were brutally killed, maimed, raped, or cut up and stuffed into a refrigerator). Her character is guarded in a world where being a successful female can get you a lot of negative attention, and she uses humor to throw up walls. Yet, Conley brings so much depth to the character that it’s difficult to guess Kt’s reaction to any given situation, or when she is being herself. Unfortunately, Ryan Edlinger (as our protagonist Chad Mailer) is not always up to matching her complexity. Edlinger’s comic timing is brilliant, but his dramatic scenes have a tendency to get shouty (a problem not solely his in this show). In the many scenes of conflict he has with Kt and Ted Thompson his acting is at times one note. However, his scene with Box near the end of the show (and I won’t mention what happens to save you from spoilers) is easily the most touching scene- it absolutely makes up for the laughably terrible stage punch they share in an earlier scene. Both actors perfectly balance heartfelt with not being cheesy; it’s one of those moments where the audience goes dead silent; in a play this funny, that doesn’t happen often. To wrap up: go see this play. Their lights are clever, their sound is full of hilarious nerdy references, the script is clever, the characters are interesting, and the actors are brilliant. I could not recommend this show more, any criticisms I made did not detract from one of the most enjoyable nights I’ve had at the theater in a long while.